Quite a while ago my Mom gave me some pictures so i can reproduce them. This is my Mother’s family. No need to talk about my dirtbag Father and his branch of the family! My Grandparents died many years ago and beside my Brother & Ma i do hardly get to see the rest of our relatives. But that’s a long story. The Gang! 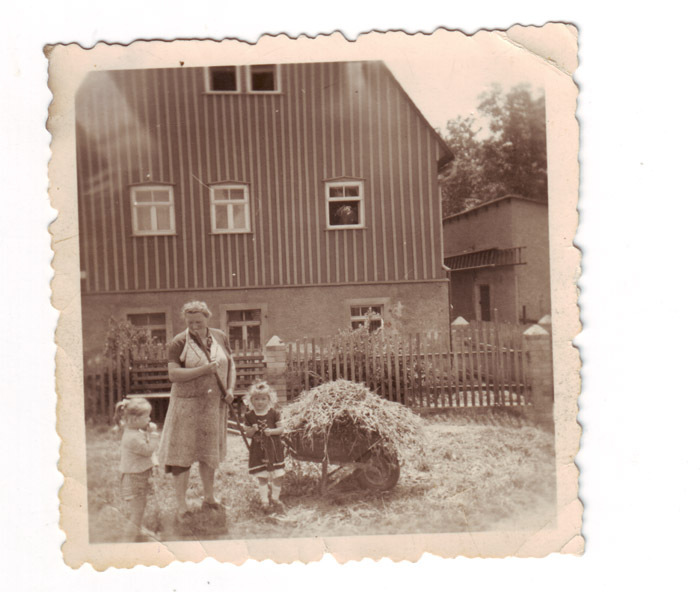 Ma with a fancy apron dress next to her Sister Christa & husband Gerd. 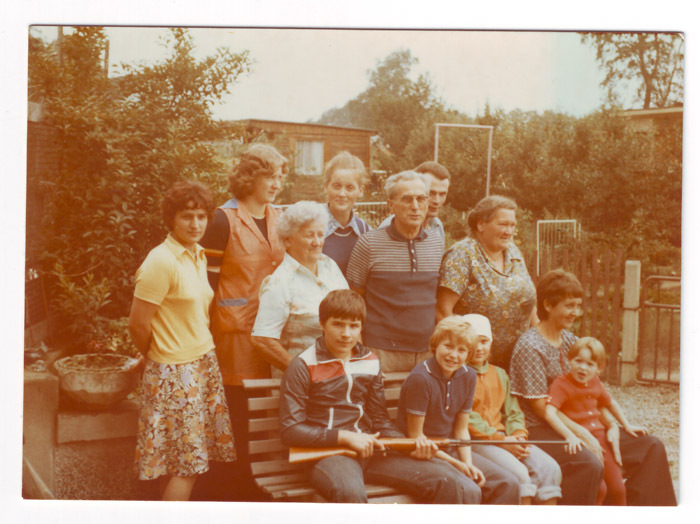 Grandpa & Grandpa in front of her accompanied by our wealthy relative from West Germany, Herma. Most of the kids i can‘t identify. 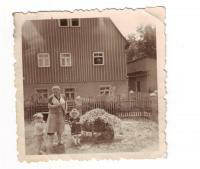 The Lady with a child in her arms is my Aunt Gerda who died about 2 years ago. In the back you can already see some of the allotments that later on surrounded us. A picture of our house. No idea when it was taken. Long long time ago, maybe in the 1920s or 30s. The house was first mentioned back in the 16th century! In the beginning used as an entry for mining it was later transformed and extended into a residence. Today the building is under monumental protection and currently without any occupants. What can i say?! The goofy looking one is my Brother Lars. The guy whose nose he tickles myself and the commander-in-chief MAMA. 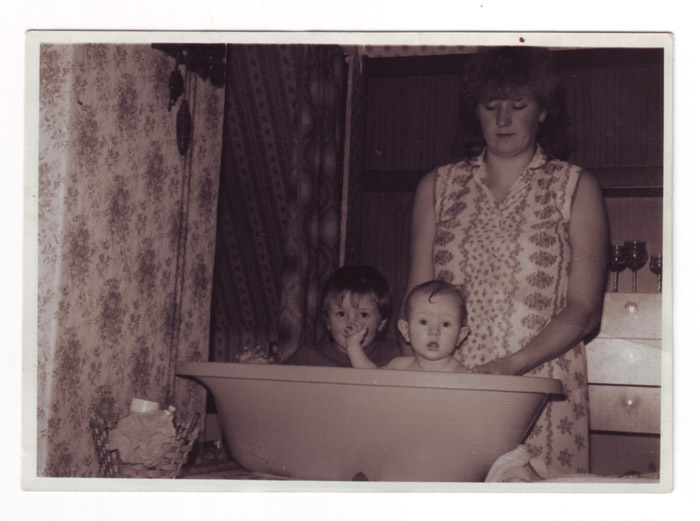 The tub still exists, but there will be difficulties for me to fit it. Again a picture of our house. Note the fancy fasade! 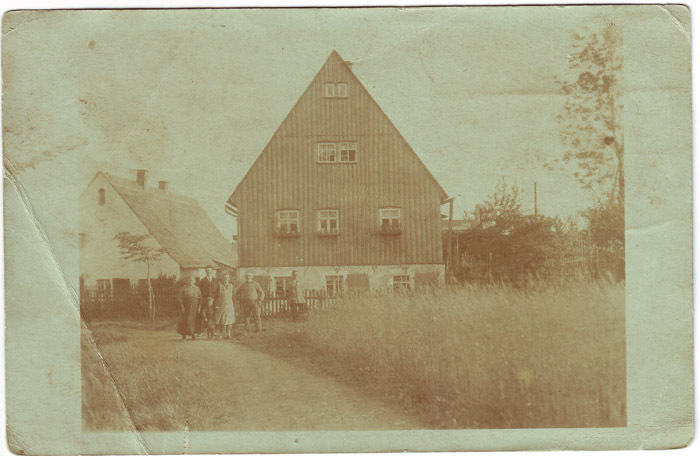 Grandma, who’s just making hay to feed the rabbits, & Grandpa had their rooms ground floor. Lars, my parents and i inhabited the other two floors after my Aunt Christa and her family decided to move to a plattenbau (they did regret that later and blamed us for scaring them off). There’s Ma but i don‘t know the other peewee, most likely one of her Sisters. This is by far my fave picture. Mom, Grandma & Grandpa. 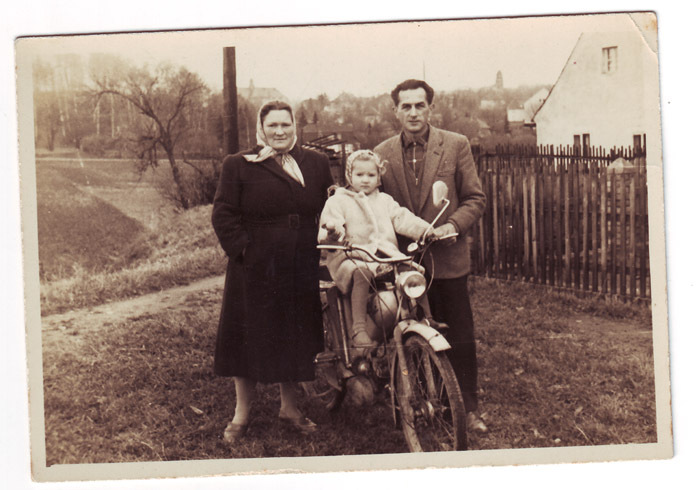 This picture was taken about 45 years ago and looking at it again it makes me think if it’s this bike my mothers boyfriend repaired and gave it to her as a birthday present last year. I think that’s the one! The area completely changed since then. The kinda rural space you can see in the back is now flattened and you can find tons of allotments, some houses and a kindergarten there. My Mom is just about to do the driver’s license for bikes. Young Grandpa. He was lucky not to be forced to do his military service in Nazi Germany. A deadly lung disease was diagnosed and he was given another year to live. He died at the age of the 85 many many years later. 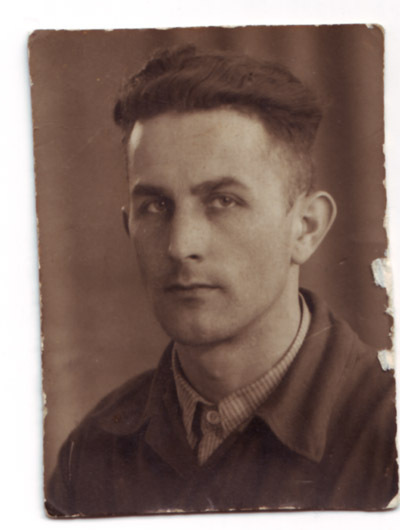 He was a convinced communist, but after world war II when he stole a few turnips and was sent to jail cos the party didn‘t help him he was finished with communism. My Grandpa Kurt was the one who taught me complex card games like Skat at an age i could hardly walk. Daddy always was an idiot. About 15 years ago he went to the backyard with loppers in his hands. Being asked what he is about to do his answer was: Lopping the cherry tree. And lopping was what he did. After he was done there was not much left of the huge cherry tree, the tree i climbed so often in my childhood and that provided us with tons of cherries every summer. 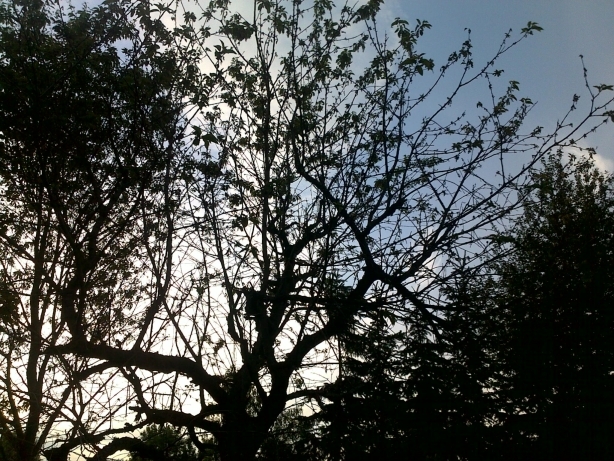 For 2 or 3 years now there’s a bit hope, some blossoms, but cherries didn‘t grow on it for 15 years.